Professor Larry Rosen joins us to discuss the addictive nature of today’s technology and some of the psychological disorders that result such as Obsessive Compulsive Behavior. Rosen will flesh out the ramifications of technology on our families and culture. He has studied this issue for some 30 years and is the past Chair of the Psychology Dept at California State University, Dominquez Hills. Dr. Rosen has been featured extensively in television, print, and radio media and has been a commentator on The Daily Show, Good Morning America, NPR, and CNN. He has been quoted in hundreds of magazines and newspapers including USA Today, New York Times, Newsweek, Time, Chicago Tribune, and Los Angeles Times. 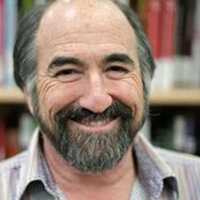 He maintains an extremely active research program and his most recent investigations include: (1) generational differences in technology use and multitasking, (2) the distracted mind from the dual perspectives of psychology and neuroscience, (3) the impact of technology on health and sleep, (4) integrating technology in education, and (5) the impact of task switching during studying and in the classroom. Dr. Rosen has four children (and three grandchildren) including one in the iGeneration, one in the Net Generation and two in Generation X and lives in San Diego, California. For fun he creates works of “art” from a combination of old computer technology, clocks and early rock and roll music. In his free time he enjoys reading international intrigue novels, fiddling with the newest geek toy, horse racing (watching and betting, not participating), going to independent films, listening to rock music, reading the NYT, listening to Howard Stern, traveling and drinking coffee. To get your copy of iDisorder, please click here.